Give her a very special necklace with this beautiful Birthstones Inside Heart Necklace in white gold from Apples of Gold Jewelry. The necklace is available in your choice of 10K or 14K white gold, and features a lattice like cage design that holds up to 8 genuine gemstones. The gemstones are 3mm in size and round cut, and the whole of the pendant measures just under 3/4 inches tall x 0.59 inches wide. A lace like design goes around the outside of the lattice heart, giving it an extra touch of femininity. The necklace includes an 18 inch chain, making it a beautiful gift that she is sure to cherish forever. 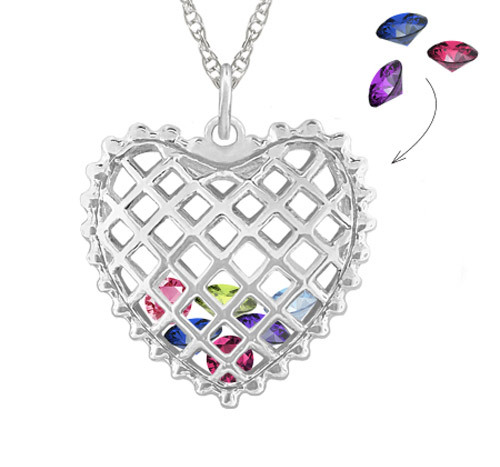 We guarantee our Birthstones Inside Heart Necklace in White Gold to be high quality, authentic jewelry, as described above.